Hello! 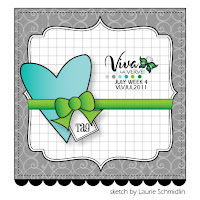 This is my final card for the VLVJUL 2011 Sketch Challenge for this month! I love this pretty paper. And I love this stamp set! After constructing the card, I decided to add a little white acrylic paint. I used a sponge brush. I thought this might add something a little different. I am getting more interested in adding paint to my cards, etc. It is a new learning experience! Thanks for stopping by! And your comments make my day!